We wish to extend to all a late but happy and good New Year! 2. Grants: We are very grateful for the Grants we received in 2014. These are much needed for equipment for our new building and for Kyle’s wages. Grants included B.C. Gaming ($6000); Columbia Kootenay Cultural Alliance – CKCA ($4000) to digitize photos. We have over 15,000 photos digitized so far and we are finally using up the CKCA 2009 grant of $20,000 for furniture and equipment; NACFOR ($6,000) and Nakusp Foundation ($500) for our entrance sidewalk. We thank Rosemarie and staff for all the hard work they have done to prepare and follow up the applications for these grants. 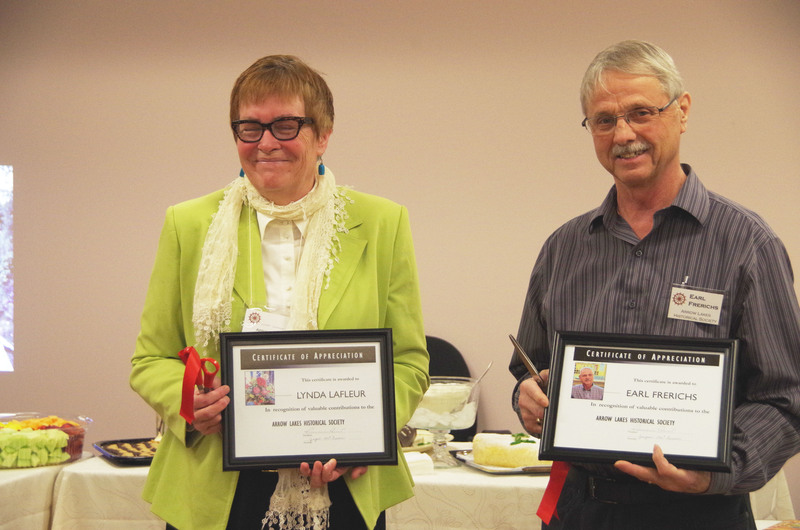 We also wish to thank all of the volunteers who have contributed over a total of 2000 hours to our Society this year! 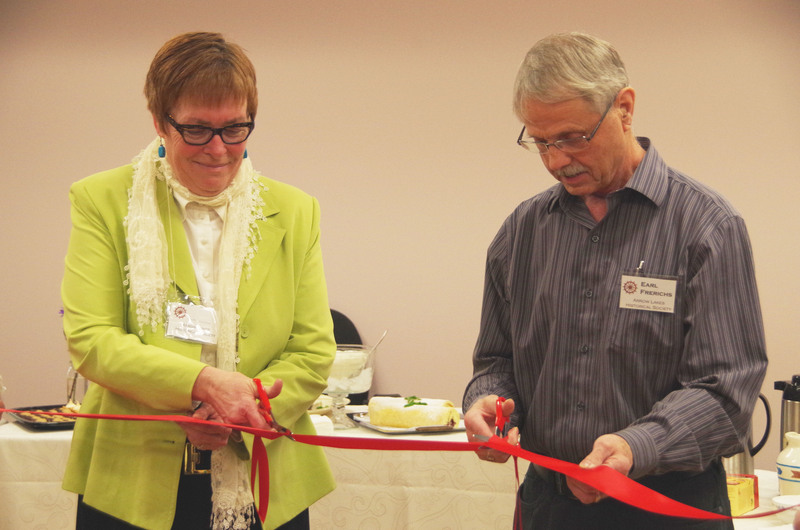 Our Opening Ceremony & Ribbon Cutting for our new building was held on April 5th with over 80 people attending. 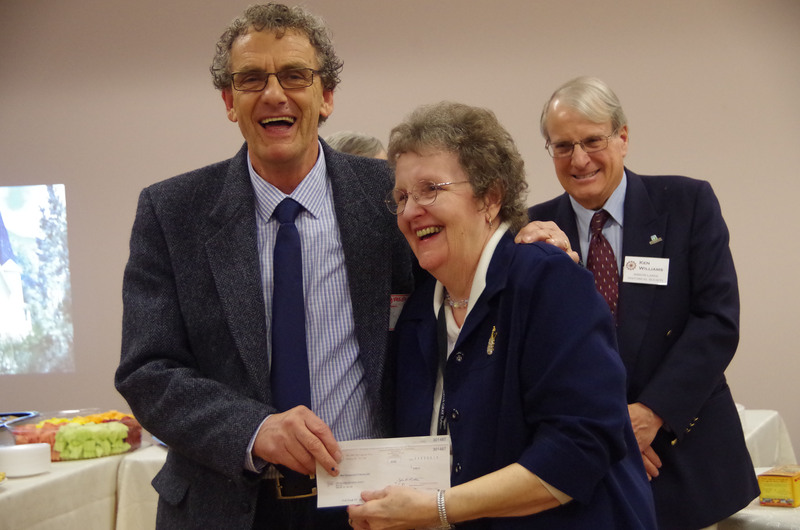 A surprise and much needed cheque for $9000 was presented to Rosemarie by Paul Peterson from the RDCK. We thank all those who helped with the heavy move of maps, file cabinets, books, binders and furniture, from our old offices to our new building in February. Our AGM was held in April at our new building. Bruce Rohn’s photos were a big success as was Greg Nesteroff’s post card collection. We hosted the AGM for the Heritage Foundation of South East B.C. at our new building in September. Our field trip this year was to Birds Landing and Old Arrow Park. Members and guests toured the sites of these pioneer communities in September and enjoyed a picnic lunch at the Old Arrow Park Memorial Grounds. Booklets showing maps and notes about these places were prepared by Ollie Roberts, Kyle and David and were given to participants. Kyle prepared and presented many Slide Shows on the history of Nakusp and the Arrow Lakes. 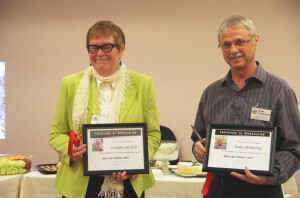 Presentations were given at the Archives, the Seniors Centre and Selkirk College. The shows are for education and are also used to raise funds for the Society. Ken Williams and Kyle presented a slide show on the 100th Anniversary of WW1 held at the Archives and a slide show on the 70th Anniversary of D Day at the Legion. A DVD on the MINTO, done by Milton, is now available. The 10 minute video can be purchased for $5. An 80 inch TV and sound system was purchased and installed for our slide shows. Our members volunteered at many fundraising and promotional events for the ALHS including Meat Draws at the Legion, Bingo and Silent Auction, PALS “Creative Hands” Craft Fair, the sale of used books, and slide shows. A Celebration of the 30th Anniversary of the ALHS will be held on Saturday, January 24 from 1:00 to 5:00 at the new Archives. The actual date of our Anniversary was in December, 2014 but it was too busy a time of year to hold the celebration then. We hope all members and many others from the community can attend. Our AGM will be held on Friday, April 10 from 1-5 p.m. We encourage all to come and bring friends if you wish. The BC Gaming Grant requires that we send in the AGM minutes and want to see a good attendance of members at the meeting. We are hoping Hal Wright from Sandon will speak about Sandon’s history. It is possible that our field trip for 2016 will be to Sandon. A new book on the MINTO is being written by Bruce Rohn and we hope it will be published next year. Our field trip for 2015 will be to the old Fauquier and Needles area on September 19th. Peggy is preparing maps for the tour and Bruce and David are adding information about these communities. Digitizing Photos: Kyle will be helping four of our members who are interested in learning how to do work with photos. He is continuing to work on thousands of photos by Milton and those donated by several families. Landscaping of our entrance with a garden of plants and bushes is planned for the Spring. The BC History magazine will have a feature article about our Society in the Spring edition. Slide Shows: Kyle will be doing more of these in the upcoming year. Hopefully, you will continue to support our society by keeping up your membership with us. Meetings are held at our office during the day – the 3rd Thursday of the month at 3 p.m. We don’t meet during the summer or at Christmas but we do have a Christmas party mid-December for members and guests. New members are always welcome. Our office hours are yearlong – Tuesdays and Thursdays, 10-3, except for 2 weeks during Christmas. We hope that you will visit our office and see what we have and what we have accomplished. Also if you have any archive items or information that you would like to donate, we would appreciate receiving them. Our location is the new annex to the Nakusp Library and Museum. Our offices are on the second floor. The building is wheelchair accessible and an elevator is available. Our parking lot and entrance are behind the Post Office. Come and visit us! The Arrow Lakes Historical Society just celebrated their 30th anniversary from when they obtained their Society registration on the 4th of December 1984. Their first year, they completely overhauled the museum which was started in 1968 by the Kinettes of the Kinsmen Club. When the Kinettes had to move on to other projects, Harry Murphy and Bert Gardner tried to keep the museum open in the summers. They asked for assistance and a few meetings later, the Society was formed and work was started – cleaning, making new display areas, painting the cement floors, repairing the showcases and to get it ready to reopen in the summer of 1985. To do this work, we contacted Denis Stanley of the Arrow Lakes News to print several small books to cover the costs – the Pioneer Cook Book, Christmas Stories, a poem book, the Arrow Lakes Indians booklet and a reprinting of the PTA cook book that was printed in 1949 as a fund raiser to build the elementary school. In 1989, through the help of a Federal grant they printed their first book of the Centennial Series called Faces of the Past. We had archive material brought to the Society from Milton Parent’s hobby of taping pioneers and copying their priceless pictures with names and occasions already given. This made the writing of this book much easier because we already had the information needed. This won them their first Award for Historical Writing from the BC Historical Federation. As they sold their books, they saved the funds from book sales to produce six more books. 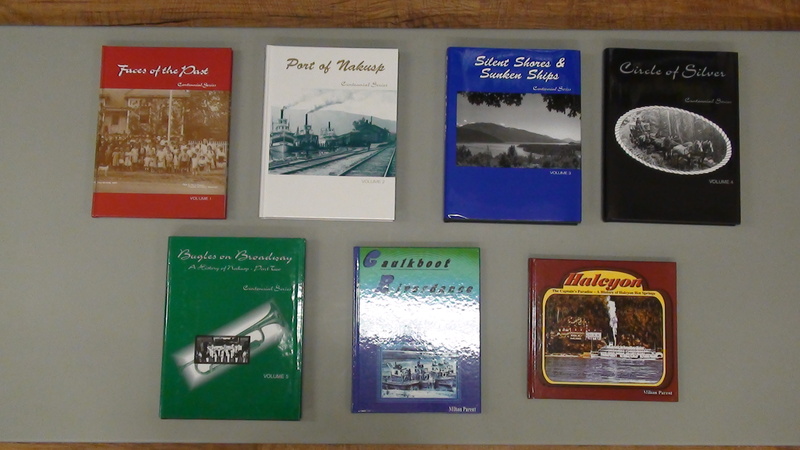 Port of Nakusp, Silent Shores and Sunken Ships, Circle of Silver, and Bugles on Broadway completed the five books of the Series. Milton Parent won the coveted Lieutenant Governors’ award for Historical Writing for the book Circle of Silver in 2001. He then wrote Halcyon: a Captain’s Paradise and Caulkboot Riverdance. We have had to reprint four of these volumes and we do have them all in stock. When a space for rent became available in the Hydro office, the Historical Society and the Museum decided to separate. There had never been any room in the Museum for the archival material that we were accumulating and which was stored and worked on in the basements of members. We moved into the new office at the Hydro office in 1999. After fifteen years of being at this office, we wondered how long we would be allowed to stay there and also what would happen if the valuable items we had were put into storage. Photos, negatives, and paper items would soon deteriorate. Milton decided to ask the Village of Nakusp if we could build an addition onto the Centennial Building that already housed the Museum and Library. The Village agreed to the construction and after several years we managed to build a spacious office for all of our material. On the 5th of April we opened our new office to the public and we were thrilled to be able to have more room to do our work and to hold meetings in. Through another grant (Columbia Kootenay Cultural Alliance), we managed to obtain funding to buy the desks, tables, chairs, an 80” TV set with complete sound system so that we could show our slide shows to the public. We hope to show these to school students in Nakusp as well. With the sudden passing of author/historian Milton Parent in 2012, we had to find someone with expertise to digitize the over 10,000 photos that Milton had accumulated while taping interviews from 1972 on. Most of these early pioneers are gone but the photos are named and therefore very valuable. Kyle Kusch has been working with us and is very able to do the work on the photos. So far over 15,000 photos have been digitized, named and are available for the slide shows that we have been putting on. Even though these photos have been used in the books that we published and used in newspaper articles, the photos were not given to the society until last year as part of Milton’s estate. A book on the SS Minto is being prepared now and we hope that it will be ready to publish next year. We will be doing more family tree work as well; especially of the pioneer families. We managed to complete taking photos of the houses on the avenues and finding the information of when they were built and by whom, and hope to do the same on the streets of the town this coming year. Be sure to check out the Fall 2014 edition of British Columbia Magazine, which has a wonderful feature on Nakusp. Our own Rosemarie Parent was interviewed for the article, which you can read on the BCM website here. The Arrow Lakes Historical Society opened up their new office and about 80 people attended the ceremony and Katrine Conroy MLA for Kootenay West was on hand for the occasion. Also attending was Lynda Lafleur of Columbia Basin Trust who helped the Society with advise and CBT funding, Paul Peterson of RDCK made a surprise donation of $9000 to complete the funds needed to complete the addition. Karen Marshall was in charge of the sumptuous food which was heritage oriented and beautifully displayed. Many items were gluten free as well. Everyone was impressed with the space, the 80″ TV and furniture, shelving, desks and chairs that were paid for by a Columbia Kootenay Cultural Alliance grant. 2. BC Gaming grant was for $5,000 this year and we will try for an extra thousand next year to help with Kyle’s wages. 3. Our big project this past year has been to finish the 2 storey addition to the Centennial Building by Lonestar Construction. We kept plugging away for more funding and will be able to move in by February if all goes well. We used the $20,000 for office equipment from the Columbia Kootenay Cultural Alliance (CKCA) for desks, tables, chairs, shelving and so on. 4. Another grant from CKCA for $4,000 was used last year to help with Kyle Kusch’s wages to scan, organize and categorize the over 10,000 photos collected by Milton Parent. We are applying for another of these grants because there is still much to do. 5. Kyle will be putting on a course to do this photo work soon – David Coleman, Ken Williams and I will do this but others are welcome to learn how. This training will be in the evening because some people cannot attend during the day. 6 We hope to increase our hours to include another day and will be open Tuesdays, Wednesdays and Thursdays. We will need more people to work in the office and if anyone is interested please advise. 7. Our AGM will be held on 4th April this year at the new building from 2-5 p.m. We encourage all to come and bring friends if you wish. The BC Gaming grant requires that we send in the AGM minutes and want to see a good attendance of members at the meeting. Bruce Rohn, a long time director, will be joining us and will be bringing some of his wonderful photos for you to see. Greg Nesteroff another director will be showing his slides of postcards of the West Kootenay. 8. We hope that you will visit the office and see what we have and what we have accomplished. Also if you have any archive items or information that you would like to donate, we would appreciate receiving them. 9. We hope to do another virtual museum project this year on Halcyon Hot Springs We will be writing a grant to do this and because we have a lot of photos and information, should be fairly easy to do. This will give us another $2500. 10. Our trip this year near the end of June or September will be to West Arrow Park. This will be a picnic. Please advise if you are interested and we will contact you. 11. Family Tree program – this program was started a few years back and we need someone to do the work that we started. We did enter several families including the Aaltens, Bairds, Baileys and Parents – trying to do the early pioneers first. Anyone interested in doing this, please advise. Memberships are $5 per year. Meetings are held at our office during the day – the 3rd Thursday of the month at 3 p.m.. We don’t meet during the summer or at Christmas but we do have a Christmas party mid December for members and guests. New members are always welcome.